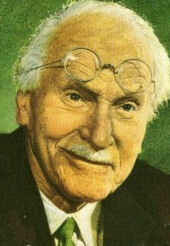 The most obvious similarity between the lives of Carl Gustav Jung (1875 – 1961) and myself is that we were both the second sons, but first surviving sons of our parents, and we both broke with our former lives in our late thirties. In Jung’s case, he broke with Sigmund Freud’s psychoanalysis, going through a profound inner transformation, expressed in words and pictures, published in The Red Book, the largest book I’ve ever borrowed from a library. In my case, following a life-changing, apocalyptic awakening in 1980, I abandoned my business career with IBM to use my skills as an information systems architect in business to develop a comprehensive model of the psychodynamics of society in the context of evolution as a whole, recognizing Consciousness as Ultimate Reality. So we have both been engaged in establishing psychology—as the science of mind, reason, intelligence, and consciousness—as a genuine science, the most fundamental of all the sciences on which all sciences and humanities are built. As Sonu Shamdasani tells us in his introduction to The Red Book, from Jung’s earliest days at the prestigious Burghölzli Mental Hospital in Zürich, “It was held that by turning psychology into a science through introducing scientific methods, all prior forms of human understanding would be revolutionized. The new psychology was heralded as promising nothing less than the completion of the scientific revolution.” Psychology thus held the potential of a deeper understanding of human nature than had previously been possible. However, progress was slow. In 1935, Jung was bold enough to call psychology the ‘science of consciousness’ in the first of a series of five lectures he gave on the theory and practice of analytical psychology to the Institute of Medical Psychology (Tavistock Clinic). He added, “[Psychology] is the science of what we call the unconscious psyche,” a science he said had not yet left the cradle. In the 1930s, Jung also set out to develop a coherent Weltanschauung, healing the fragmented mind with a synthesis of the sciences. Weltanschauung derives from German Welt ‘world’, from Middle High German wërlt, from Old High German weralt, cognate with world, and Anschauung ‘view’, from Middle High German anschouwunge ‘observation, mystical contemplation’. So Weltanschauung has a deeper meaning than worldview, indicating both scientific observation and spiritual meditation. As Sonu Shamdasani tells us in Jung and the Making of Modern Psychology, “To counteract this situation [the detrimental effects of specialization], and to provide a ‘complete picture of our world’, information from all branches of knowledge needed to be collated together. This could be attempted by finding a platform or idea common to many forms of knowledge. From the foregoing, it is clear that Jung conceived the cultural role of complex psychology to be to counter the fragmentation of the sciences, and to provide a basis for a synthesis of all knowledge. This attempt to counter the increasing fragmentation and specialization of disciplines was an enormous, and ultimately insurmountable task.” As we can now see, with the benefit of the abstractions underlying the Internet, this task in no longer insurmountable. Despite people’s resistance to change, to look inwards, Jung set out to reformulate the practice of psychotherapy, recognizing that modern psycho­therapy could help to bring about a new form of social order in an era of transformed social relationships, not unlike Erich Fromm’s vision. Much influenced by the alchemists, seeking the Philosophers’ Stone as Wholeness, and Nicholas of Cusa’s coincidentia oppositorum, Jung well understood that unifying opposites is the key to sound mental health, calling syzygy the androgynous union of anima and animus, at the heart of his psychospiritual goal of individuation—the development of an undivided being. 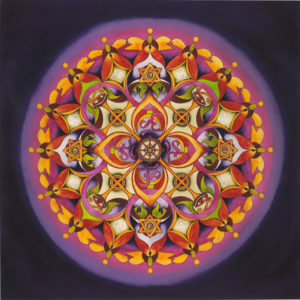 In depth psychology mandalas are often used as symbols of this healing process. For a mandala, a Sanskrit word meaning ‘disk, circle’, is a circular figure representing Wholeness or the Universe in Hindu and Buddhist symbolism. 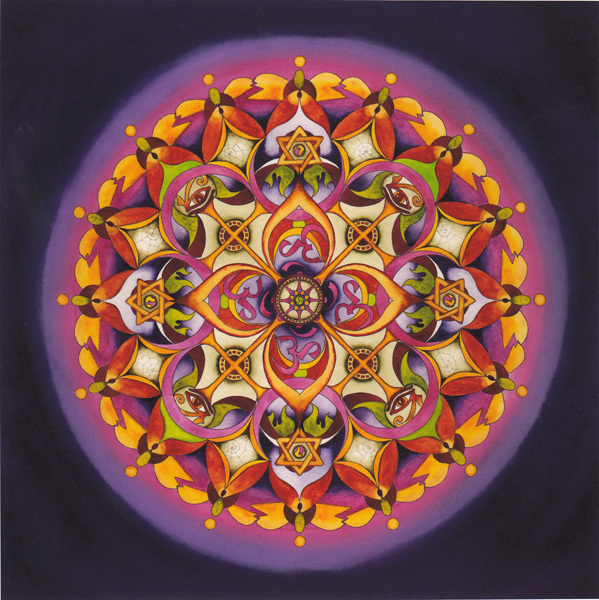 Indeed, taken out of their psychotherapeutic environment, mandalas can be geometric objects of much beauty, such as this Harmony Mandala, drawn by Vikki Reed of Arizona in 2005, integrating symbols from nine different cultures from East and West. By unifying the opposites, we can heal the split in the human psyche that first appeared many thousands of years ago, as we can see from the derivation of human, which is Latin humus ‘ground, earth’, from the Proto-Indo-European (PIE) base *dhghem– ‘earth’. In contrast, Divinity derives from Latin deus ‘god’, from the PIE root *dyeu ‘to shine’. These etymologies show that our forebears some 7,000 years ago conceived of humans as earthlings in contrast to the divine residents of the heavens, as Calvert Watkins explains in The American Dictionary of Indo-European Roots. This split between humanity and Divinity is also the root cause of all the Holy wars (wars about the Whole) that have bedevilled human affairs during the patriarchal epoch, especially those between the three Abrahamic religions of Judaism, Christianity, and Islam, as mentioned on the page for Erich Fromm. For these believe that their particular view of a separate God is exclusively the only true one, to be defended at all costs, even to death. To see the origins of this mental disorder, in Patterns in Comparative Religion, Mircea Eliade calls Cusanus’s coincidentia oppositorum the ‘mythical pattern’, for archaic societies were well aware that this term denotes the very nature of Divinity. As he says, “even within as strict a tradition as Judæo-Christian religion, Yahweh is both kind and wrathful.” Going further back to “the palaeolithic stage of culture and religion, the myth of the cosmic hierogamy was unknown, [for] … a certain number of the Supreme Beings of the archaic peoples were androgyne.” It was only later that gods and goddesses—as divine human energies—began to ‘marry’ each other and procreate. Then with the birth of the patriarchal religions, God became masculine, especially in Christianity. In a Jungian analysis of our collective psychosis, Paul Levy writes, “God’s dark and light sides were completely split and polarized in the figures of Christ, who was totally light, and Satan, the embodiment of the darkest evil.” Then, quoting Jung’s Aion, Satan, the adversary, “represents the counterpole of that tremendous tension which Christ’s advent signified”, accompanying Christ “as inseparably as the shadow belongs to the light”. Yet, even though Jung’s father and eight uncles were pastors, he well knew that Christ is not a person, an essential principle that permeates the popular A Course in Miracles, expressing the perennial wisdom in an opaque language derived from Christianity. Rather Christ is the Universal or Cosmic Christ, the culmination of Teilhard’s process of Christogenesis, when Alpha and Omega become unified in Wholeness, when the personal becomes the impersonal, and when all there is is Love, which has no opposite. The Cosmic Christ, as the Great Attractor for all our lives, is not exclusive to Christianity. For instance, this term is a synonym for Buddhahood, which we realize when we are fully awake, from Sanskrit budh ‘to awaken’, root of buddhi ‘the power of forming and retaining conceptions and general notions, intelligence’ and buddha ‘conscious, intelligent, wise’. As the central purpose of analytical psychology is to unify opposites in Wholeness through the process of individuation, it is a pity that it was not called psychosynthesis. However, before the First World War, Roberto Assagioli was also in the process of setting up his own psychotherapeutic theory and practice with this title, somewhat different from Jung’s approach. In brief, Assagioli was critical of Jung’s endeavours to cocreate a new social order, saying that the purpose of personal psychosynthesis is to help practitioners become harmonious individuals, “well adjusted both within themselves and with the community to which they belong and in which they play a useful part”. Assagioli went further, seeing the need for spiritual psychosynthesis, a ‘psychosynthesis of religions’, by which he meant understanding and appreciating religions as they are, inheriting fears and beliefs laid down hundreds and thousands of years ago. Yet with today’s children not being educated to live in the world that will exist by the end of the 2020s, holding on to our traditions is no longer a viable way of living. With evolution currently passing through the most momentous turning point in its 13.8 billion-year history, it is essential that we awakening individuals tune into these synergistic evolutionary energies, along the lines that the Community page indicates.